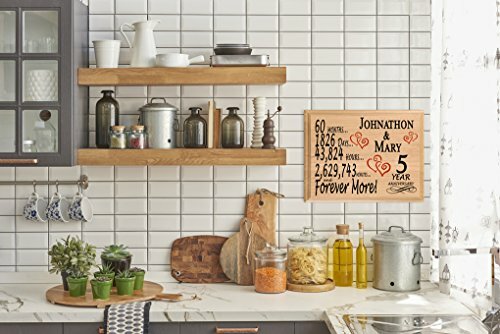 This wonderful 5th Anniversary Gift Wood Plaque is the perfect personalized 5 year anniversary gift idea! Carefully crafted in the United States from solid maple wood, this unique personalized five year anniversary gift plaque will be cherished for years to come. The artwork is carefully applied to the wood in a unique process developed by Broad Bay to allow the beauty of the wood to show through the design. 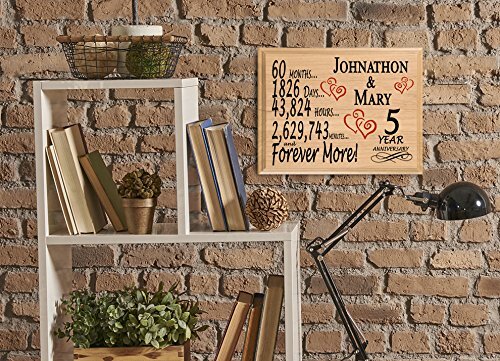 Personalized with the couple's name, this custom 5 year anniversary gift plaque is perfect over a bed, on the mantel, or hanging anywhere in the home, as a loving fifth year anniversary remembrance.